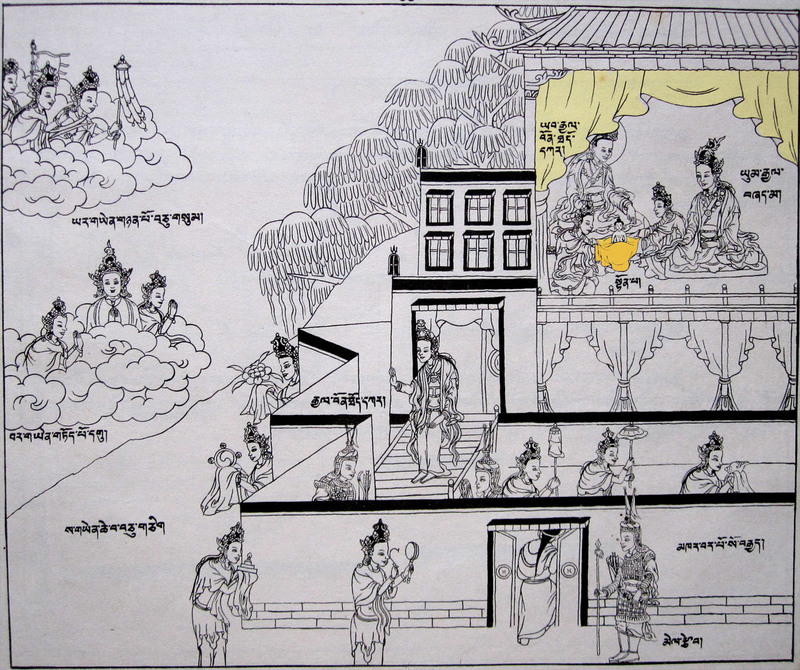 According to the Yungdrung Bön, the Buddha Tönpa Shenrap Miwoche took birth into this world over 18,000 years ago in the land of Olmo Lungrig as a prince in the palace of Barpo Sogyé. He was already and enlightened being and therefore beyond cyclic existence. However, because of his great compassion for sentient beings who experience missery and suffering, he took birth in this realm. Therefore, the act of birth was a great deed of compassion. He was born just before sunrise on the 15th day of the 12th lunar month to the king, Gyalbon Thökar, and to the queen, Gyal Zhema. He showed all of the major and minor marks of an enlightened being. A gathering of gods from above, a gathering of deities from intermediate space, and a gathering of powerful spirits of the earth, all circumambulated the palace and proclaimed that they had come to be the first disciples of the Teacher. He was given the name ‘Shenrap’ because he was born into the Shen clan and was the highest, rab. He was named ‘Miwoche’ because he had taken a great human form. His personal name was ‘Künle Namgyal’, Completely Victorious over Everything. Posted on September 19, 2013, in Tibetan Culture & History, Tonpa Shenrap, Uncategorized, Yungdrung Bon Monasteries and tagged Asian studies, Buddha, spirituality, tibet, Tibetan history, yungdrung bon. Bookmark the permalink. 2 Comments.